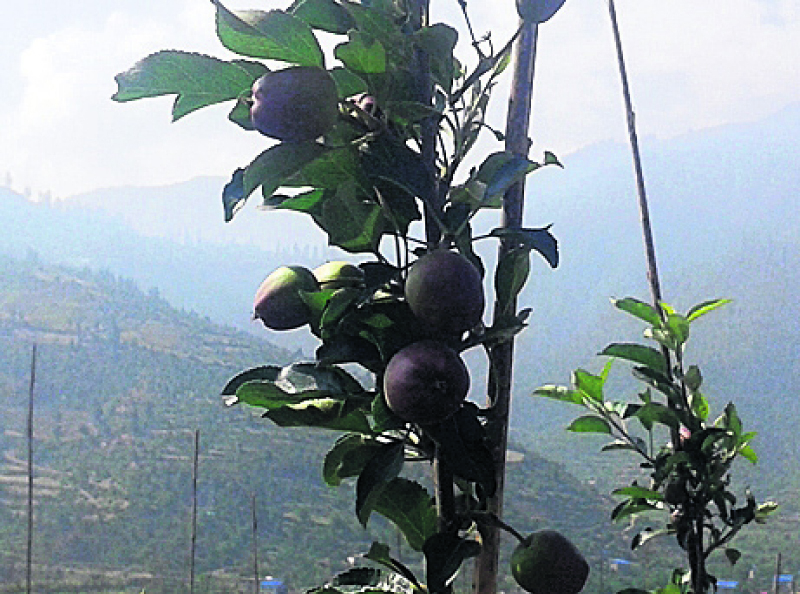 JUMLA, June 11: Farmers in Jumla have produced Italian Fuji apples for the first time. Local farmers are very much excited as Italian Fuji apples bear fruits in just three months of transplantation. Other varieties take three to five years to bear fruits. Jumla Agro Farm had transplanted 1,700 saplings of Fuji apple in 10,000 square meters of land in Sera Jyula three months ago. Most of the plants have already bore fruits. Similarly, Hamro Agriculture Cooperatives had transplanted 800 saplings, according to Lok Darshan Shrestha, proprietor of Jumla Agro Farm. It took farmers Rs 1,400 to Rs 1,500 per saplings to transport the saplings to Jumla. Local farmers have invested Rs 4.5 million to grow 2,700 saplings. Sera Jyulo has now become Fuji Apple orchard. Many people throng the orchard to see plants bearing fruits in just three months. Some local farmers worried that the new variety would replace local variety. The cooperative has also decided to conduct awareness among local villagers about the benefits of cultivating of Fuji apple. The apples grown in Sera Jyulo will be ready to send to the markets in two months. Local farmers say the apple plant will yield fruits for 27 years. Each plant will produce 42 kg of apples after four years. The saplings first arrived at the Kolkata port of India and then transported to Nepal via Birgunj Customs Office. Earlier, Manang Agro had transplanted saplings of Fuji apples on a trail in Manang district. This apple variety was introduced to Jumla in the initiation of youths of Jumla. 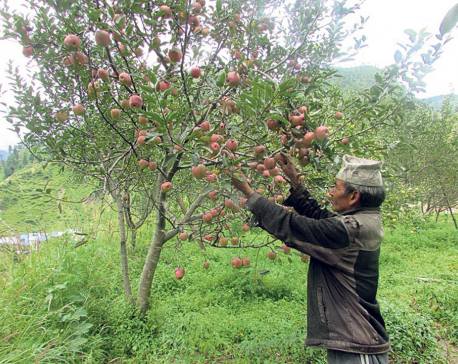 This apple variety has also been cultivated in Tamti of Tatopani rural municipality. Jumla Agro Farm and Hamro Agriculture Cooperatives have taken land of Chandan Nath Bhairab Nath Guthi on a 10-year lease. 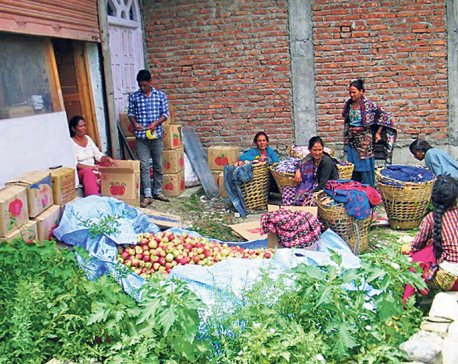 “Through apple farming, we are trying to disseminate message to local youths that we can do something in our country itself,” said Devkota. The farm is also planning to produce and distribute saplings of Fuji apples to local farmers. The plant bears fruits two times a year and the fruit is sweeter than the local variety.